The car has been in storage and someone clearly ran into the passenger mirror and it now wobbles a bit. The entire mirror, not just the glass like often happens on antiques. 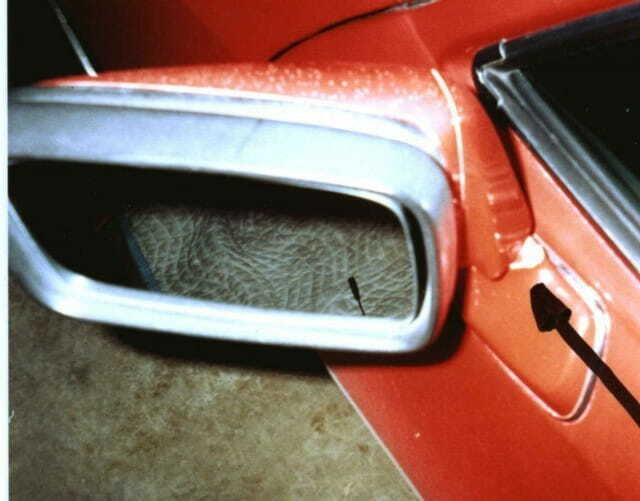 Does anyone have a good guide for removing the passenger mirror from the door? Once in there, I'm sure I'll simply find a bent bracket I can straight and retension, but getting it off will be the trick. Anyone deal with this already? 84 944, 87 Vanagon, 88 Mitsubishi Van Wagon, 88 Supra Targa, 1990 Audi 90 20V Quattro sedan, 1992 Lexus LS400, 1993 LandCruiser, 1997 LandCruiser, 2017 Subaru Outback. The mirror assembly is held on by one bolt. If it wobbles, more than likely all you need to do is tighten that bolt. To get to it, lift up slightly on the flag portion of the mirror and push it backwards towards the front of the car. It takes some force to do this. Once it's back you'll find the top of the bolt holding it on. It's a (I think??) 5mm allen head. Be forewarned that this bolt tends to get rusty and may be frozen so penetrant would be advisable before trying to turn it. If tightening this bolt doesn't stop it from wobbling, one of the fingers on the bottom may have broken off which is quite common with the aero mirrors (similar mirrors on later 911's and 968's) in which case you'll need a new mirror. But try the bolt first. Thank you. Potentially this could be easier than I'd hoped. If I need to take if off, does that one bolt release the mirror? Or do I have to take the interior trim off, etc? That one bolt is the only thing holding the mirror on. The only reason you'd need to remove the door panel is if the wiring harness plug has been cut and the wires soldered together by a previous owner like I've witnessed on more cars than not through the years. So yes, it could be easy but I've learned to never put my cart before the horse with these cars.